Lately, it seems that winters are getting more severe every year, and snow fall is getting more and more unpredictable. Areas that did not used to get serious winter storms are now experiencing unprecedented snow fall, and areas further north are also getting record blizzards. In light of this, you want to make sure that you are prepared for anything that Mother Nature can bring your way. If you live in an area of the country that is at risk for serious winter snow, you want a heavy duty, powerful snow blower in your garage that is ready to go at a moment’s notice. You never know when the next big snow storm is going to hit, and you do not want to be left unable to deal with it and calling in a plow service. When this is the case, a big two-stage gas snow blower is just what the doctor ordered. The Snapper 1696000 is a big, powerful machine with a top quality engine driving its auger and self-propelled rear wheel drive. It has everything you need to handle whatever winter storms bring your way. The engine on the Snapper 1696000 is a Briggs & Stratton model with 205 cc displacement. This manufacturer is a leader in the small engine industry, and with its engine in your snow blower, you can be certain that it will provide reliable performance and power over the long term. The clearance width on the Snapper 1696000 is a full 24 inches. This is the reason you want a big, two-stage snow blower: it can clear your driveway and walkways so efficiently that you will be looking for more ground to cover once you’re done! And because it has such a tall snow cut depth, you never have to worry about being snowed in by a powerful blizzard. This snow blower can tackle anything that might come your way. The ease of use on this snow blower is impressive: all you have to do is fill the gas tank, hit the electric starter button, set your desired speed and you are on your way to clearing your property of snow quickly and efficiently. The Snapper 1696000 is a gas powered two-stage snow blower with dimensions of 38 x 26 x 30 inches that weighs 214 pounds. It has an electric push button start and a Briggs & Stratton 4-cycle engine with Overhead Valve and a displacement of 205 cc. It has a self-propelled drive with 6 forward and 2 reverse speeds. 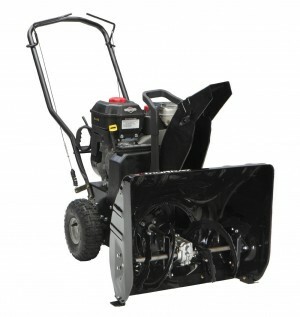 The Snapper 1696000 has a clearing width of 24 inches and a snow cut depth of 21 inches. It can throw snow through its manual chute up to 35 feet, and the chute rotates 200 degrees. The wheels are 13 x 4 inches and the handle and steering have a unique, ergonomic design. The snow blower comes with a 2 year warranty. There is a very good reason two-stage gas powered snow blowers remain wildly popular these days, in spite of rising gas prices, laws regulating small machine emissions, and high pollution. The reason is that these snow blowers are far and away the best, most powerful ones on the market today. And the Snapper 1696000 is no exception. When you get it out of its box, it takes only about fifteen minutes to get it all put together, and once it is sitting there, fully assembled, you can practically feel how powerful it is. That’s because it is a big machine with a wide clearance, an impressive auger, and an engine made by one of the top manufacturers in the country. Briggs & Stratton has long been a respected name in small engine fabrication, and there is good reason for that. This company consistently makes outstanding engines that perform well for many years without needing a lot of maintenance. They seem to have figured out that small engines can still be very powerful ones, and with that in mind they repeatedly come up with innovative design strategies to put more horsepower and torque into smaller displacements. Because of the excellent engine under its hood, the Snapper 1696000 is able to support such a wide clearance and high snow cut depth, and still throw high volumes of snow up to 35 feet away. And at the same time, this snow blower has six forward speeds as well as two reverse speeds. The rear wheel drive is quite powerful, and you will be able to clear driveways that are on steep inclines without having to struggle to get the snow blower up them. With a snow blower that is this powerful in your garage, you will be ready to face whatever surprises winter can bring your way. Because winters are getting more and more unpredictable, you want a machine you can count on to start up and clear snow reliably every time. There are plenty of models out there to choose from, and you have to be sure you find the right one for you. The Snapper 1696000 packs a lot of power under the hood and has what you need to consistently be prepared for a variety of different conditions. Powerful Briggs & Stratton engine : If I were designing a snow blower, I would want a Briggs & Stratton engine under the hood. These are really some of the very best small engines you can find in yard machines today. This company has over 100 years of experience manufacturing quality engines and continue to be on the cutting edge today. The engine in the Snapper 1696000 has a displacement of 205 cubic centimeters, and an overhead valve design. Because it’s a 4-cycle, it will be easier to maintain. Six forward speeds and two reverse speeds : The powerful engine on the Snapper 1696000 supports not only the robust auger, which can throw snow practically to your neighbor’s yard, but also a high-powered rear wheel drive. The self-propulsion mechanism has six forward speeds, which is two more than most self-propelled snow blowers have, as well as the standard two reverse speeds. This means you can tackle steep inclines easily, as well as select the speed that is best for your pace. High and wide clearance : The clearance on the Snapper 1696000 is two feet wide, which means you will have walkways cleared on a single pass, and driveways finished before you know it. And the snow cut depth is a full 21 inches, which is more than enough to handle snow fall from even the biggest now storms that could come your way. This is the kind of clearance you need in your garage so you can be prepared for anything this winter. Unique steering design : The steering design on the Snapper 1696000 is unique and extremely convenient. Snapper calls it the Free Hand Control drive. This allows you to control the snow blower with just one hand, which leaves the other hand free to adjust the speed or rotate the snow throwing chute with the other hand. This means you will not have to stop as often as you would with other steering designs, which will help you finish jobs that much faster. Great accessories : After covering the engine’s size and ability and the clearance width and snow cut depth, many of which are very similar from one snow blower to the next, it is the little factors that help make one snow blower stand out as compared to the rest. Accessories like powerful headlights and big, tough tires can really make a huge difference in terms of your overall snow clearing experience. The Snapper 1696000 has both, which are a testament to its convenience and ease of use. The Snapper 1696000 is designed to provide power and convenience to homeowners with big driveways who are going to be threatened by big snow storms over the winter. It has the kind of high quality engine and large clearance you want in order to always be ready for whatever might come your way, and it has design notes that help to make it an all around snow blower that is easy to get started and use. It would be a stretch to call any of the lesser points on the Snapper 1696000 “Cons.” Most of these are simply aspects of design that are common to all big, gas powered two-stage snow blowers, but I would be remiss if I did not discuss them in some detail. You should know exactly what this snow blower has to offer, including the areas in which it is less than perfect. Let’s take a look. High emissions, non-CARB compliant : Because it has a powerful, 4-cycle engine with an Overhead Valve design, the Snapper 1696000 does produce a relatively high volume of emissions. The main drawback to this, however, has less to do with its total performance and more to do with the fact that it means you cannot purchase or use it in any states that enforce the California Air Resources Board emissions standards. This is a real shame, because it’s such a great machine. Heavy, a bit hard to maneuver : Big, powerful snow blowers like the Snapper 1696000 are going to weigh a lot, which is one of the reasons having so many forward speed options is such a great feature. But at 214 pounds, turning this one can be a bit difficult, especially on uneven ground, although with some practice it gets easier. The weight is also not the highest on a snow blower like this one by a long shot, but it’s worth mentioning. Has a large footprint : As with the snow blower’s weight, because it is supporting an extra wide clearance and high snow cut depth with a powerful rear wheel drive, the Snapper 1696000 is a big machine. This is part of owning a two-stage snow blower, but it can also present minor issues: the snow blower can be a bit difficult to store easily in your garage or tool shed, since it takes up a lot of room, and getting it in and out of tight corners can be a bit of a challenge. Engine is fairly noisy : 4-cycle engines, especially those with overhead valve design, are some of the noisiest combustion engines out there, and the Briggs & Stratton engine on the Snapper 1696000 is no exception. While this is part of owning a big two-stage gas snow blower, it can present minor problems if you have neighbors and are ever confronted with early morning snow that you need to clear before you can get your car out of the garage and head to work. Struggles with very deep drifts : This is the only real Con around the Snapper 1696000. Because its clearance height is just 21 inches and it does not come with drift cutters, it can have difficulty getting through big snow drifts that have been piled up by gusting winds. At the same time, you can always purchase drift cutters separately and attach them yourself if you live in a region that tends to have deep snow drifts, so this is more of a minor problem than a serious one. As you can see, none of these “Cons” are the kind of serious problems that would overshadow any of the Pros, let alone raise the kind of red flags that would make me suggest that you should walk away from this snow blower altogether. All things considered, the Snapper 1696000 is still a very solid snow blower with a lot of excellent features. The fact that it is big, loud, and noisy is part of what makes it so powerful. When you are shopping for a new snow blower, what you are ultimately trying to find is a very dependable machine that you can count on even when the temperature drops below zero and heavy snow fall starts to pile up. Because of that, you want the best possible machine you can find in your price range. Comparison shopping is one of the best ways to determine if a particular product is right for your needs. The following chart compares the product specs of the Snapper 1696000 with two very similar snow blowers. As you can see, the Snapper 1696000 is the only one of the three snow blowers with six forward speeds and a 200 degree radius on its snow chute. Of the three machines, though, the Husqvarna is definitely the biggest, and has the highest clearance width and snow cut depth. While those extra six inches are going to make a big difference, the Husqvarna is also considerably heavier than the other machines and does not have a Briggs & Stratton engine, and it also costs considerably more. If you are gearing up for a long, deep winter, you want a snow blower in your garage that you know you can depend on. For regions that receive heavy snow fall through the winter months, a two-stage snow blower is really the only way to go, especially if you have a lot of ground to clear. The Pros and Cons should help you decide if the Snapper 1696000 is the one for you. Six forward speeds and two reverse speeds. With its top of the line engine, six speeds and extra wide clearance and snow cut depth, the Snapper 1696000 has a lot to offer homeowners who live in regions that get hit with serious snow fall. It also has great design notes and excellent accessories that ensure your snow clearing experience will be as easy and convenient as possible. Heavy, a bit hard to maneuver. Struggles with very deep drifts. When you are looking at gas powered, two stage snow blowers, a lot of them are going to be noncompliant with CARB emissions standards. All of the ones that are up to snuff are also going to be big and heavy. So while these are minor drawbacks, none of them is a reason not to purchase the Snapper 1696000. Winter is coming: do you have what it takes in your garage to face it? If you live in a region of the country where heavy snow fall is common, you need a big, powerful snow blower that you can be sure you can count on every time you need it. A gas powered two-stage snow blower like the Snapper 1696000 is the perfect machine for homeowners who can expect serious snow fall through the winter, and especially those who have long, broad, or unpaved driveways to keep clear. With its state of the art Briggs & Stratton engine, the Snapper 1696000 has the kind of power you need to stand up to whatever winter sends your way. It has a 24 inch clearance width to quickly and efficiently clear broad driveways and a 21 inch snow cut depth to handle serious snow fall. Overall this is a solid, high quality snow blower. When you find a snow blower that has a high quality engine under the hood, the ability to quickly and efficiently handle winter’s toughest snow storms, and thoughtful design notes and convenient accessories, a lot of homeowners are naturally going to expect it to be well out of their home and garden budgets. But this doe not have to be the case. With a snow blower like the Snapper 1696000, you will find that pricing is very fair and generally pretty affordable. And because you know you can count on it for the long term, in my opinion it is worth every cent.